Right now I’ve been experiencing some interesting emotional connection to my LandLab project. This may seem odd, as my project is probably the most tech oriented of the bunch! I can only describe it as this feeling of letting go of attached ideas and really just observing and listening, both to nature and the people that know it well. That is different for me, because most of the time my projects are conceived ahead of time so they can be “pitched” to the people that may green-light them. The process for LandLab is very different because the Schuylkill Center is trusting from past work that I have the ability to produce something interesting. They are looking for ideas, but they are not holding you to them. 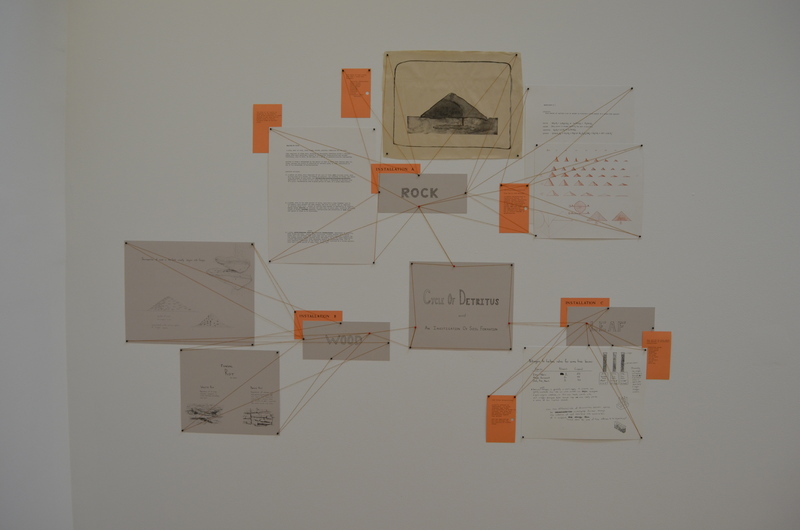 In fact if anything, they are excited by process and evolution, and the show in the gallery really speaks to that idea. The staff at the Center has been really great in encouraging my work, and allowing it to unfold. It is no different from allowing seasons to change, and I’m really experiencing that in my whole body. That’s it for the fuzzy stuff — let’s get back to the science! You may remember that I wanted to get a glimpse of Port Royale Ave. and the Center’s property in the rain. It has been difficult to do this because this fall the rain storms have been coming at night, which would not be the best time for video. However, there was a morning when it was raining, and I rushed out of the house to record. Check out the video. Although this was not a heavy storm, at least I saw the puddling on Port Royal Ave., and I can imagine in a larger storm what the situation might be. In fact, seeing how difficult it is to actually record a storm makes the idea of a stream monitor even more valuable. So, I made a visit to Stroud to check out their monitoring equipment, as well as Steve’s workspace. The property has nets for insects, buckets for leaves and other organic matter, and monitors for the stream — it’s a Disney World for scientists. 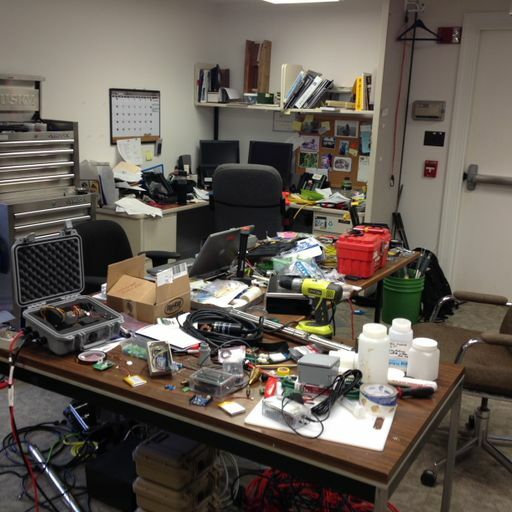 The tech space is full of controllers, sensors, cables, cases, batteries and canisters of water. It was encouraging that I was able to identify some of the parts in the bins, and Steve and I probably could have spent even more hours than we did just talking shop. After seeing what was needed, Steve helped me to order some parts. So, now I have a datalogger and an ultrasonic rangefinder at my house. The datalogger is the main board in the circuit which will give instructions and allow for data to be collected. 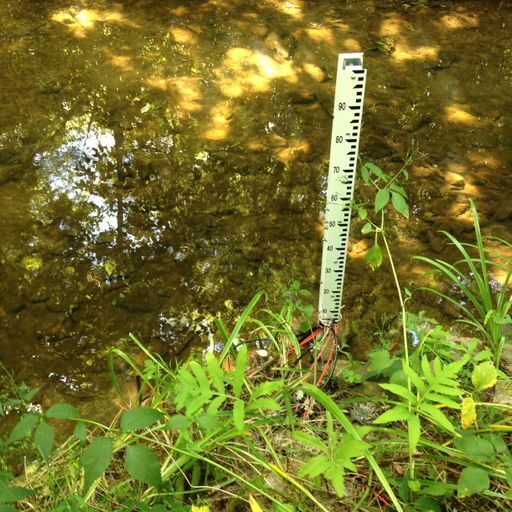 The ultrasonic sensor will measure the water depth throughout the day. So far this is a cost-effective set-up and there may be some room for another sensor. Right now I’m favoring conductivity, which looks at metals in the water. However, the sensor has to be able to withstand freezing temperatures, and Steve is currently testing a new one to see if it will be accurate. So, we will see which sensor wins. 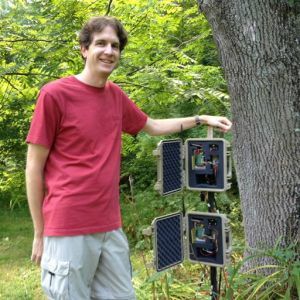 Steve has been testing equipment like this for years and is an expert on sensors and conditions. One of the frustrating things about the field is that a good part may be discontinued, which leads to more testing of new products. Also, just because the paperwork says a part will operate in a certain way under certain conditions does not always mean this is true. So, the process is never-ending. The next step in the process was to work on building a snake from burlap, and luckily I found someone interested in assisting me — Brenna Leary. Brenna recently graduated with a degree in environmental education and also has a love of plants. So, we’ve been having a lot of fun bouncing ideas back and forth. 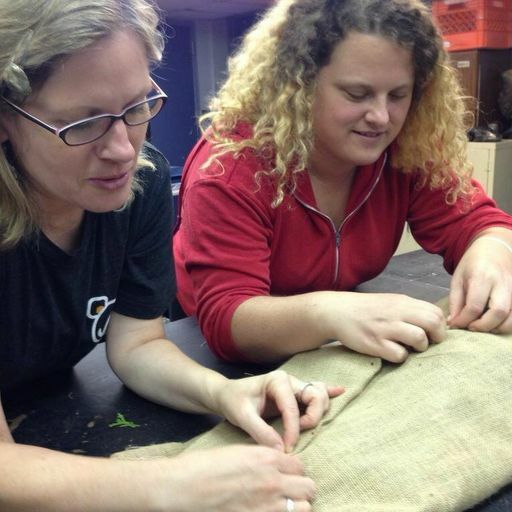 We spent an afternoon at the Center stuffing a casing of burlap with stones, wood chips, and coir. Then, we stitched the fabric shut and created the features of a tail, head and tongue with some tucks and scraps. It was a lot of fun and the resulting piece reminds me of the corn husk dolls I used to make as a child in Girl Scouts. They were featureless, but they had a beauty none-the-less, and so it is the same with the snake. I started this post with this idea of change, and it may be apparent with electrical parts, but it is even more so with art. I first imagined my burlap StormSnakes to be painted with environmentally safe paint. However, someone reminded me that even natural things can react badly when put in touch with chemicals in stormwater run-off. So, you never know what kind of brew you are going to get running into the stream. I know there are all sorts of compromises we make daily, however, I didn’t want any risk in this, no matter how small. So, one day I was having lunch with another artist friend and we got into talking about the cool plant holders made of felt and other natural ways people deal with urban plantings. I suddenly remembered those crazy Chia Pets with the bad commercials. They were ceramic objects with a seed goop smeared onto them which would eventually sprout into odd topiaries. What an interesting idea to make snakes that had growing material on them. So, I talked to Melissa at the Center about the possibility of incorporating seeds or plugs onto my stuffed burlap snacks. She definitely had some recommendations and was excited since plants are her expertise. So, I hope to now perform a test in the greenhouse to see what emerges. Can I do stripes? Would I work with different plants and textures? I don’t know and I like that answer. 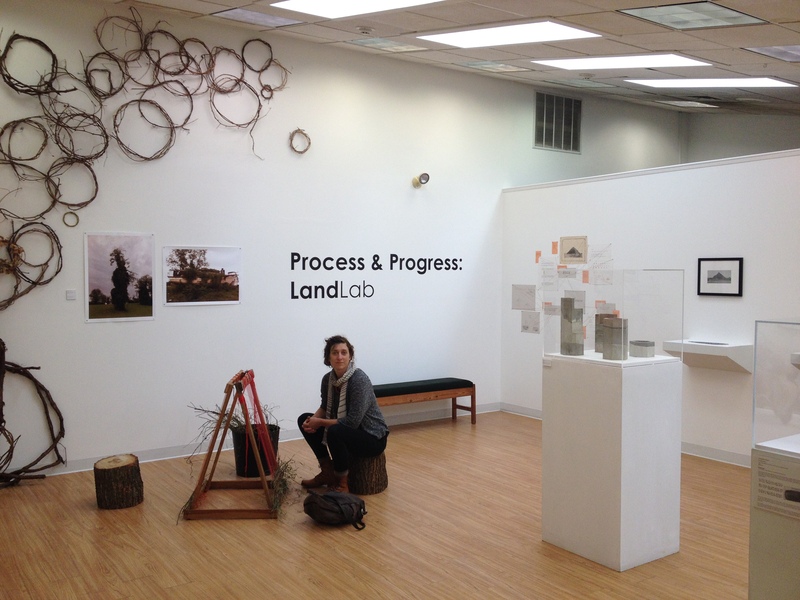 For our Landlab Residency project, the process of its creation is of great importance. 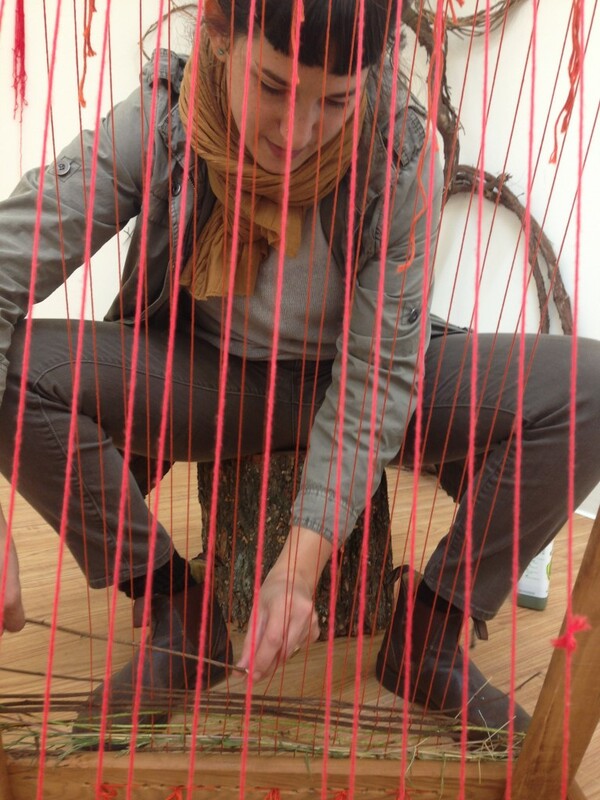 As we work towards the installation of a large-scale sculpture created from woven plant material in Spring 2015, we invite Schuylkill Center visitors to participate right now in creating the tapestry panels which will comprise it. 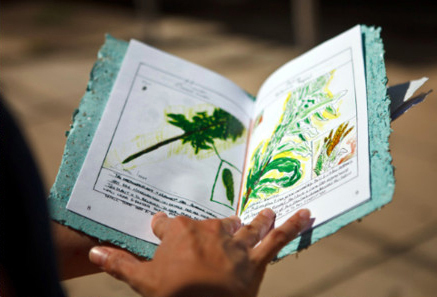 In this way, the exploration of global plant migration, and the ecological and cultural roles of non-native plants, becomes a hands-on, engaging experience, with a cumulative, archival result. 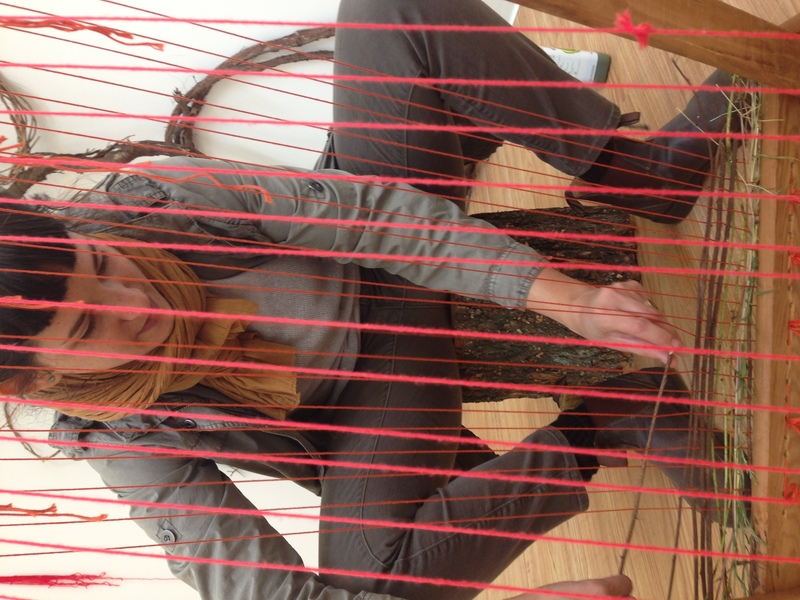 The following photos show some moments in the process– from the building and stringing of the looms, to their on-site installation, to actual weaving. 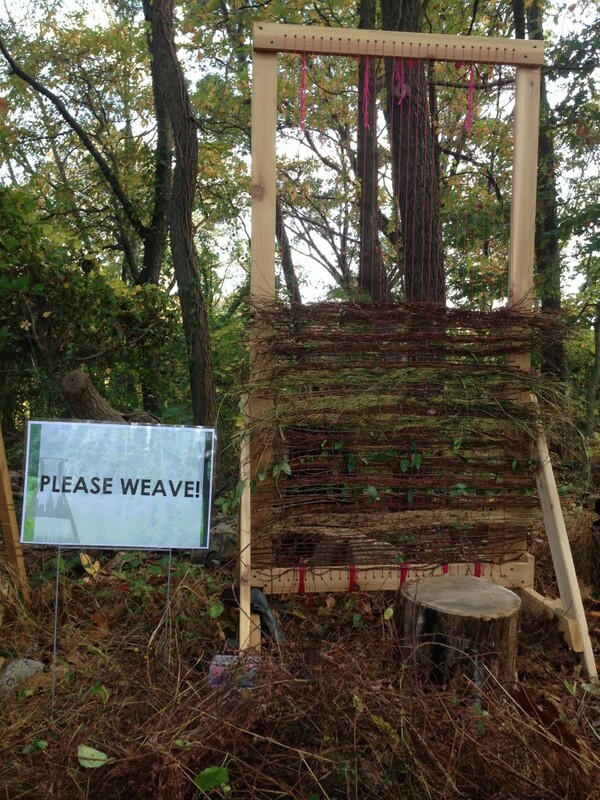 The looms will be up all fall– we hope these photos encourage you to come up and try your hand at weaving with invasive vines! With the help of Philadelphia Woodworks we built two large, free standing, cedar tapestry looms. For the warp, we are using colorful braided mason line. 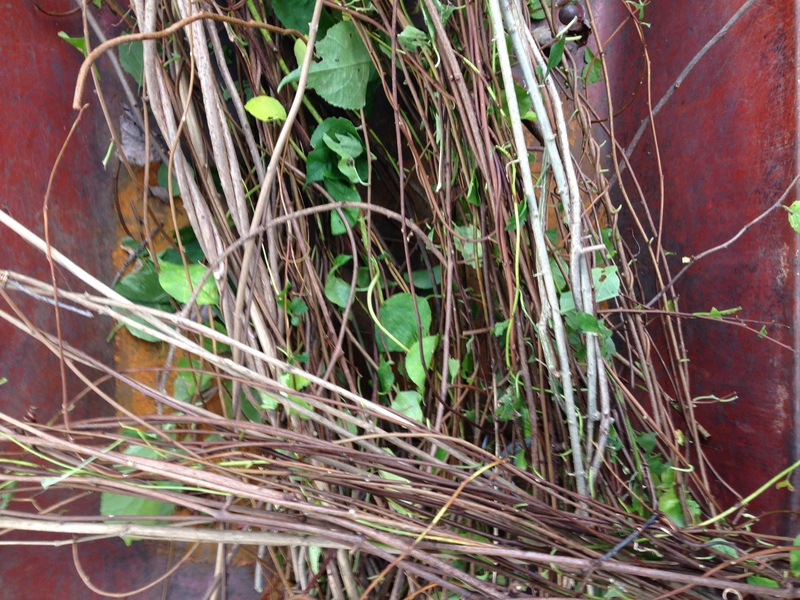 For the weft we are using invasive plants such as oriental bittersweet, mile-a-minute, Japanese honeysuckle, wisteria, Japanese stiltgrass and bush honeysuckle harvested from the Schuylkill Center. 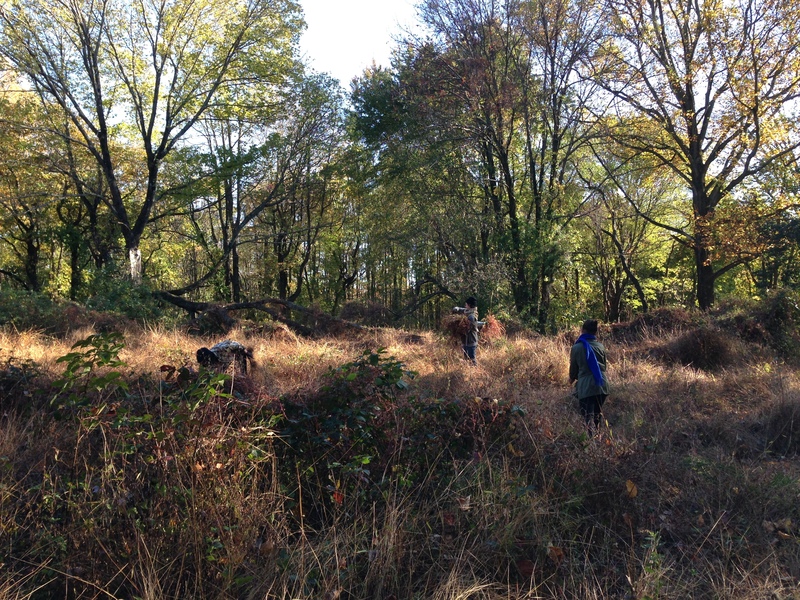 A group volunteers help remove invasives and collect materials. We process the material by cutting it into workable lengths and stripping off the leaves revealing the colors and textures of the plant material, the silvery-grey of the oriental bittersweet and the rusty brown of the mile-a-minute. With the looms strung up and material collected we are ready to weave. Friends, volunteers and students pitch in! 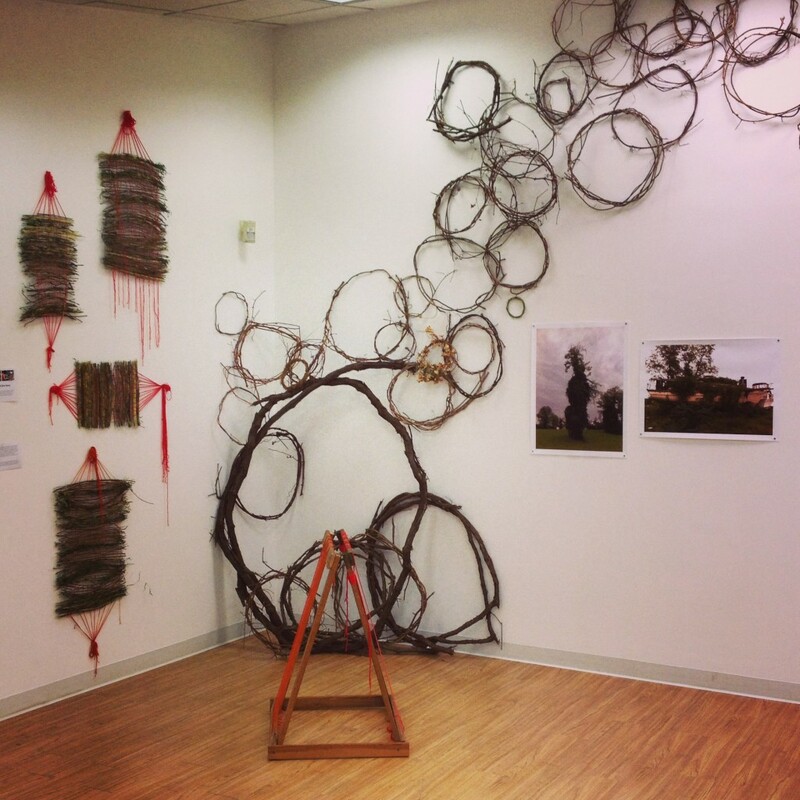 We contributed some process weavings, photos, and a vine installation to a beautiful show at the Schuylkill Center called Progress & Process, and also included an indoor loom for this show. The show is up through December 13. 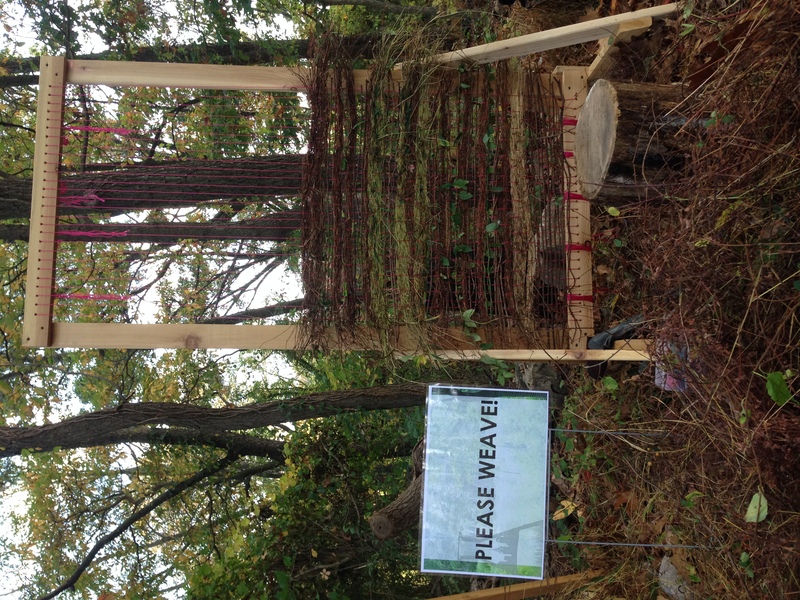 The outdoor looms will be installed at the Schuylkill Center through the end of November. Please come join us! Do you think you can weave as fast as Zya? I had the pleasure of speaking with LandLab artist Jake Beckman over the telephone recently. Jake explained that he is enjoying being a LandLab artist. His LandLab experience allows him to engage himself more with the outdoors, he says, conning him more deeply to the land. Science and art are really similar in a lot of ways. You have to imagine the unknown. A.G: What inspires your indoor/outdoor art pieces? J.B: I think the thread that ties most of them together is an interest in how things work. What are the processes that cause things to come into existence – things that we use, or part of our built environment, or things that we depend and rely on in society? A lot of [my art] looks at materials and industrial ingredients. A.G: Who inspires you artistically? J.B: That’s a tough question. I read a lot. I am really interested in a wide range of things, popular science to scientific journals to sociological studies…I like work that engages in kind of a dialogue that is accessible. 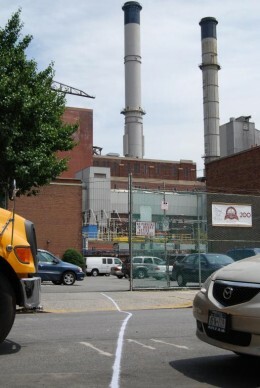 [I like] public work that is playful but also has some sort of critical sense to it. I like work that reaches beyond art and engages with people. A.G: How did you connect with LandLab? Jake explained that he received a fellowship through the Center for Emerging and Visual Artists (CFEVA). Since they were aware of his science background, CFEVA let him know about the opportunity to work with LandLab. J.B: I had been to the Center a couple of times before I ever even heard about LandLab. I just enjoyed the grounds. My wife and I had a garden plot [at the Center]. A.G: What does it mean to you to be a LandLab artist? J.B: It’s wonderful to be outside, to be thinking about making work in an outdoor environment. You know, I’m really hoping to honor this kind of spirit of engagement with the outdoors that I think the Center is trying to foster by making art that feels like it’s part of that dialogue and part of a process. It is part of this ecosystem, bringing it to life in a different way. I think it’s really been a wonderful change of perspective for me in thinking about my work and I’m really grateful for that. When you make work that lives in this white box of a gallery, things sometimes feel a little claustrophobic. This has been a nice experience to help to balance that and be engaged a little bit more. A.G: What inspired your LandLab piece? 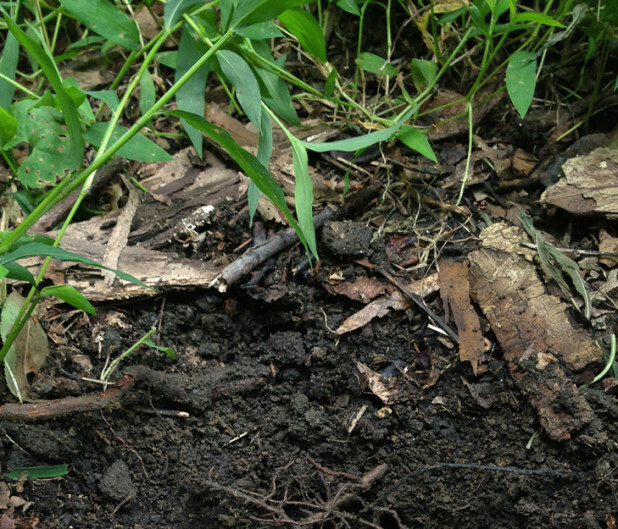 J.B: The whole overview of the project that I am working on and that I proposed is really based on my investigation into research about soil formation: the way that soils are so important for the ecology of any natural system. They are really unique in a lot of ways. They are not like normal ecosystems that we think of … because everything is happening at such a different scale and a different time period. So you think of geological processes. The project encompasses a lot of those ideas. Two or three pieces that I am thinking of installing over the course of the fall, the winter, and into next spring really look at soil formation through these lenses of time-periods, if you will. One of them is really going to look at the way stone dissolves over time and that is obviously going to be on a different time scale than the one I am making out of wood which will happen over the course of decades or less than that. A.G: What is your definition of art? What is art to you? J.B: In some way, it is sort of philosophy made material…and you know art is many things to many different people. What it means to me? [laughs] I don’t know; I think it’s play, it’s serious play. I think some of it is convention and some of it people understand when you call something art, you are giving them license to think beyond what is it, what does it do, how does it work. I think when you call something art, even though it is this nebulous term, it allows for some loosening of boundaries. …It’s kind of frustrating but also freeing, and really fun, how many different disciplines I can borrow from… and then incorporate into [my art]. A.G: What you want people to take away from your work? J.B: I guess I’m interested in drawing connections between things that we don’t necessarily connect. In my life, I’m not really connected to the land in a way that I feel like I want to be. I live in a city, in a place that is humming with activity, but it is a lot of human activity and a lot of infrastructure and I feel somewhat disconnected [from the land]. I don’t know that my work actually reconnects people or anything like that but I am hoping at some one point it’ll get to that stage where it forms those connections for other people as well as me. A.G: How does your artwork connect to science? J.B: Not as much as I would like. I think that science is the process of asking questions, posing questions, and imagining ways to answer to them. It is dealing with … mystery or exploring unknowns. I think frequently my work strives to some small degree, to pose interesting questions and elicit that sense mystery and wonder that I think science has. But I don’t think I’ve gotten there [laughs]. But I think science and art are really similar in a lot of ways. You have to imagine the unknown. You have to be really creative and come up with possible ideas; in science you then go on and test and [in] art you go on and make. 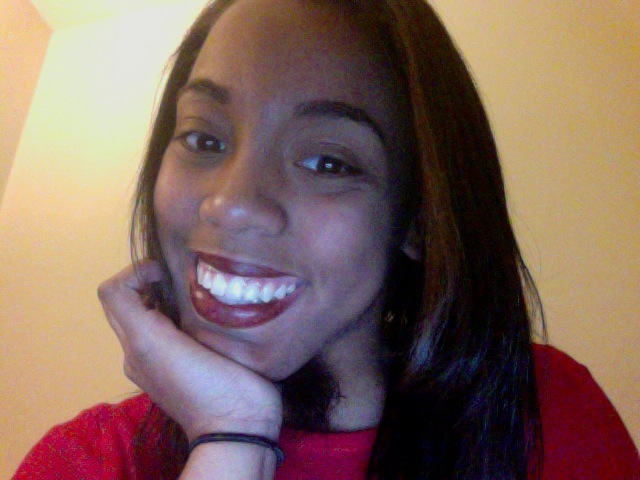 Angel is currently a student at Mitchell College in New London, CT majoring in Environmental Studies with a minor in Communications. After completing her undergrad studies, she wants to continue on to grad school where she plans to complete a Master’s degree in Public Health. Angel hopes to become a public policy writer for the EPA or FDA. I’m Leslie Birch, and I’m very curious about Philadelphia’s water. Last Thursday, I felt a bit nervous as I headed my car down the long driveway towards the Schuylkill Center. Having looked at records online for water quality in this watershed, I’ve seen mixed reports. We are located downstream from some heavy-duty coal and energy industries and also share our waters with many manufacturing industries. What hope can there be? Well, after meeting Sean Duffy, Director of Land and Facilities, I was assured there actually is a shining star – apparently the Center has some of the best water quality around because it is spring fed. Originally the land was made up of farms, and in those days you had to have a well to get your water, so this makes a lot of sense. Now, most people are connected to a community source of water through pipes, so the fact that the Center still has its original clean water source is good news. The tricky news is the issue of storm water runoff. Sean said that in the last six years, he’s never seen it so bad, and certainly this is a result of what’s going on with the climate. I don’t want to argue about what to call this global warming, but I do want to understand the resulting chaotic weather and natural disasters that are occurring. 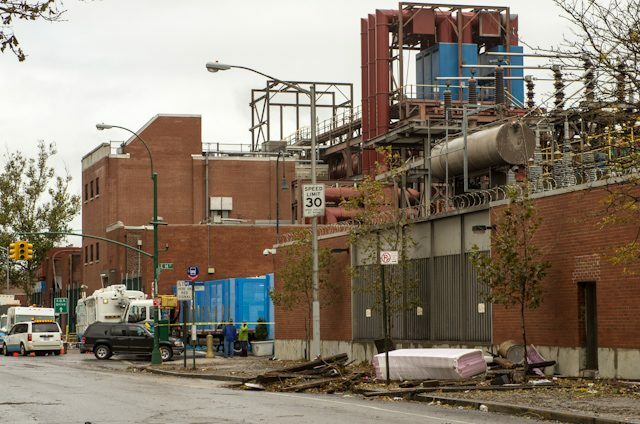 Storm water runoff is one of those disasters. I’m sure some of you have seen this damage first hand at the shore with hurricane Sandy or even here in Philadelphia with the recent flooding. This year I had a friend who was preparing to evacuate as her garage became flooded. 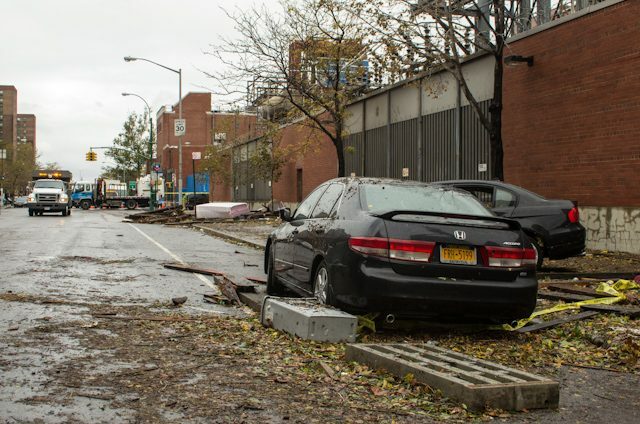 Many people’s cars were considered “totaled” after this recent storm, along with furniture and sentimental items. 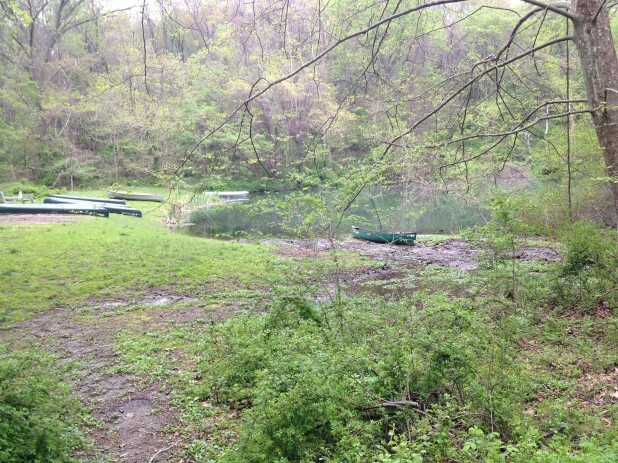 I’ve also assisted in flood preparation and clean-up at the historic Canoe Club on the Schuylkill. I’ve seen first-hand the marks left by the water level on the first floor ceiling of the building, as well as the inches of thick silt left behind by the storm. I’ve even seen injured birds and a displaced baby heron desperately looking for its mother. Recently I was reminded that even people’s pets are later found as victims of these storms. So, this rushing water is something we need to face. So, how does storm water run-off translate here at the Center? 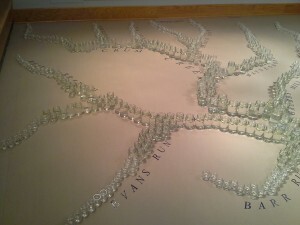 Sean was able to pinpoint the main areas of runoff on a map for me, and one of the major culprits is Port Royal Avenue. Often, roads have stormdrains that funnel rainwater away underground to be discharged into a larger waterbody during a storm – you’ve probably seen them around cities or even your neighborhood. But on Port Royal, there are no storm drains, and when it rains, the water still needs somewhere to go. 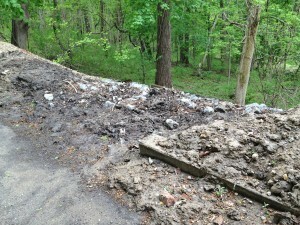 Instead, where Port Royal borders the Schuylkill Center property, there is a curb cut – the lower burm is removed to allow the water to leave the road surface. That moves the water straight off the road, leading it to travel above the ground’s surface down the hill towards Wind Dance Pond, causing erosion of the soils. You can see evidence of this in the picture. 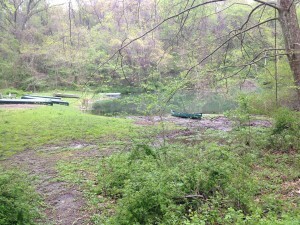 The pond soon overflows and causes water to divert towards the stream. 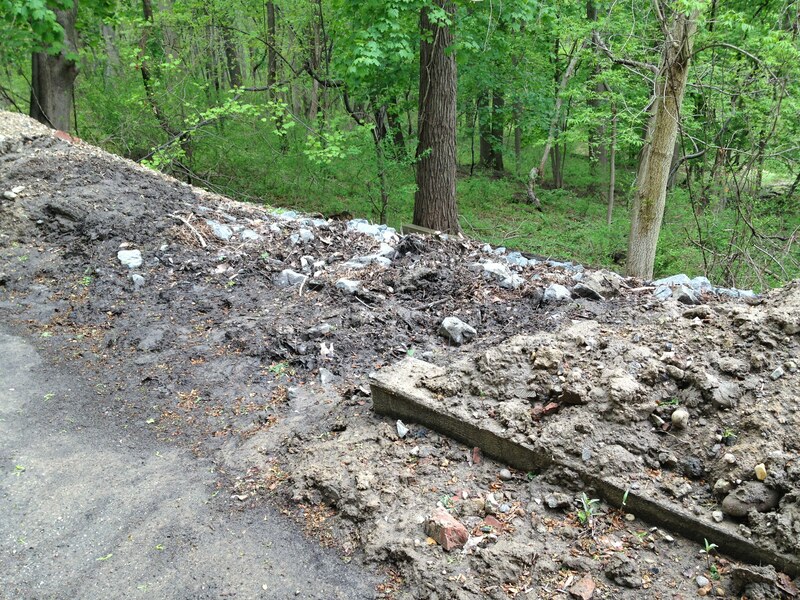 Before you know it, you’ve got damage to the stream bed and possible trail damage and downed trees. This is cause for concern and really where my journey as an artist begins. As a LandLab Resident, my goal was first to question the quality of the water, but that has now changed to question the movement of the water, specifically what happens before and after it enters Wind Dance Pond. 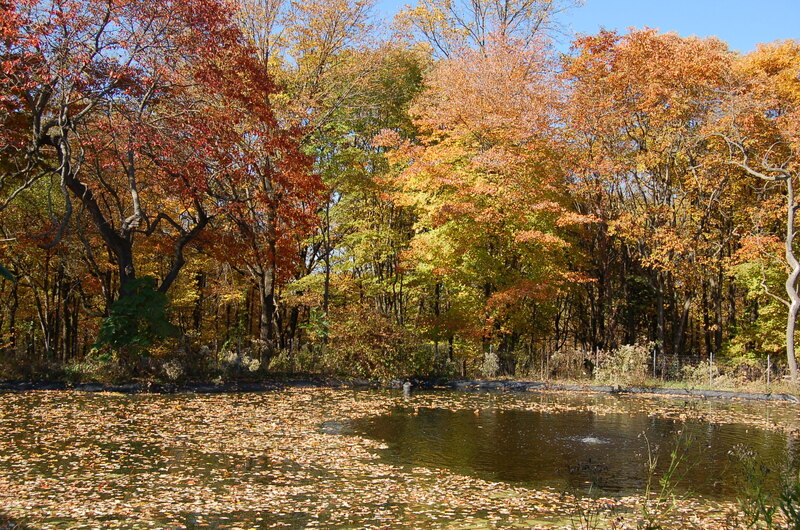 Some things to consider may be the change in the height of water in the pond, the speed of the flow of water, and even the path the water takes as it exits the pond. To gather information, I’ll need to do more scouts with Sean to see other forms of damage on the trails. I’ll also have to start researching equipment used to monitor these changes in water and figure out a way to keep it tethered under tough conditions. Finally, I’ll need to determine a way to make this information visual in a way people can understand, especially children. So, what can I do about the trickle that I see leading to the pond, knowing it has the potential to become a torrent or flood with each major rainstorm? I’m not sure yet, but I know my answer will include community. Water is a powerful agent, and it will take more than one to tame it. 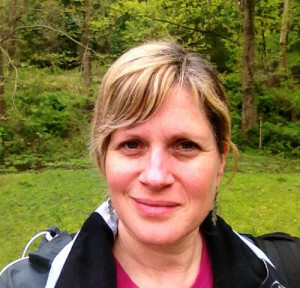 Leslie Birch is a tech artist with a love of Arduino microcontrollers. 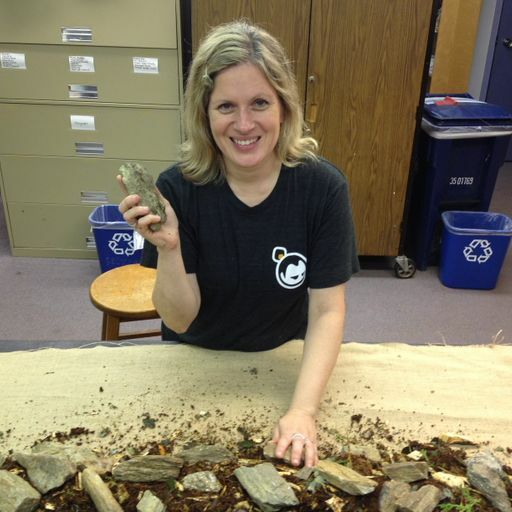 She lives near the Schuylkill River in the Art Museum area and loves birding. She also blogs at Geisha Teku. She can be found on LinkedIn, Facebook, and Twitter. We are thrilled to announce the four resident artist projects for our new LandLab residency program. Launching this spring, LandLab projects will create innovative, art-based installations that prevent or remediate environmental damage while raising public awareness about our local ecology. 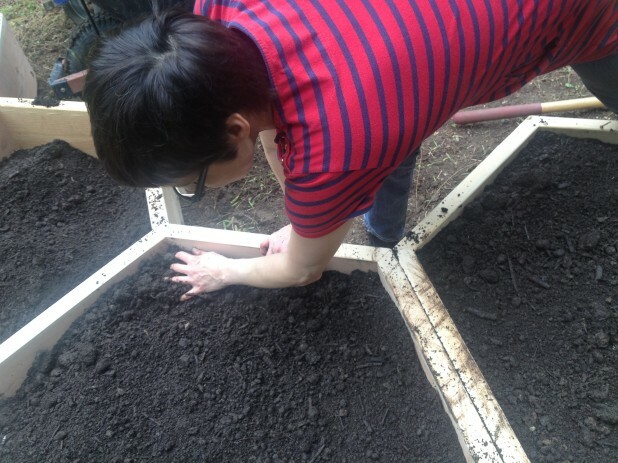 LandLab is a unique artist residency program that operates on multiple platforms: artistic creation, ecological restoration, and education. Our residency offers resources and space on the Schuylkill Center’s property for visual artists to engage audiences in the processes of ecological stewardship through scientific investigation and artistic creation. We’re excited at SCEE to offer this opportunity for artists to work in this way in collaboration with the Center for Emerging Visual Artists. 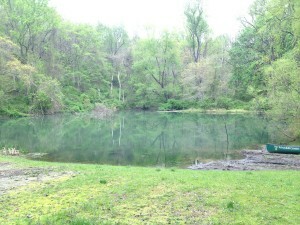 Standing in the woods near the pond at the Schuylkill Center, we can look out and see a range of time scales. The brown and golden leaves under our feet from the Fall- the leftovers of a year’s work by the trees above us. Perhaps there’s snow still on the ground from a recent storm, itself the result of the vast cycles of evaporation off the ground and from lakes and oceans into the atmosphere and clouds and back down again. Some of the trees around us are decades, maybe hundreds of years old. Frogs and fish and insects hidden underground or inside vegetation, birds in their nests chirping and flitting about, grasses, flowers each have their lifespans and carefully timed cycles to support, prey on or evade each other – evolved over thousands, even millions of years. When we think of culture and public art, we have an opportunity to think along similar time scales. Humans also have their cycles of productivity, lifespans and fleeting passions. These interests also evolve over time to reflect our knowledge, context and the resources at hand. Sometimes an artwork arrives with a bang and loud trumpets and just as quickly fades into the day or week or month only to live on in memory and documentation. Like sighting a rare Blue-winged Warbler in the forest, or waking up to an overnight dusting of snow that makes the line of every tree suddenly visible, or the miracle of a drop of dew on a leaf in the Summer that reflects a world upside down, these brief events delight and remind us of the preciousness of the present moment. Some things are simply best communicated ephemerally. A song. A performance. A rain shadow. On the medium scale, we have most plants and animals and planted crops and, alas, most human projects. We tend to think in terms of months or years or at best decades. A hundred years without regular maintenance is long for a built structure, long for most outdoor sculptures, too, even those meant to be “permanent”. It’s the lifespan of an exhibition, a person, a raven, a grove of Sassafrass (albidum) and it serves to ground us in the familiar. We can see it and know it because it’s us. Within a century, with the strategic accumulation of such medium scale projects, we can make major improvements or changes to a place and set things in motion that can last a lot longer. It’s the larger time frame that gets the least attention and is often more difficult to wrap our heads around. The scope of generations. Climate change. Geological time. Too often, these big shifts elude us. We claim not to know. A sudden revolution or a storm or an accident can thwart the best laid plans. Ultimately, we know that a focus on the specific is often too limiting a scale for something long lived and significant. At the Schuylkill Center, the increasing flow of voracious and unmanaged deer over and across the land, and the invasive Asian earthworms (Amythas hilgendorfi and agrestis) under it, are regional and even continental challenges. To encourage specific changes here, we would need to plan and coordinate with those working within much larger areas to be effective. To set in motion a resilient set of processes that truly begin to nudge us and the natural areas under our trust towards a future that can address a world in flux is an enormous challenge. At a time of massive species extinction and global changes in climate, we need a flexible and directed multi-timescale approach to culture and ecological stewardship. 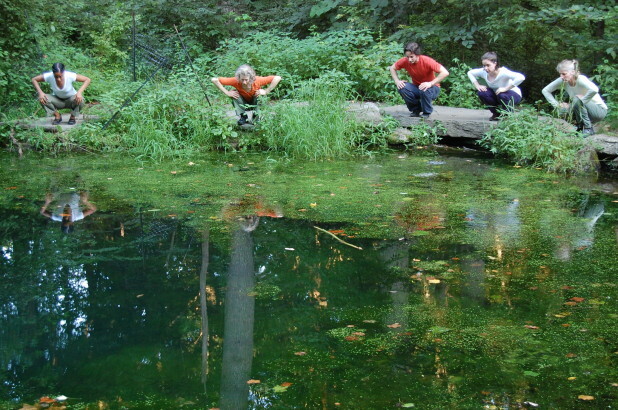 The environmental art advisory team at the Schuylkill Center in 2012. This is the challenge ahead for the Schuylkill Center. Most art, even ecological art is a flash in the pan, a tasty snack. They generate attractive catalogs and press releases and perhaps valuable discussion, but will the worms and watersheds really notice? 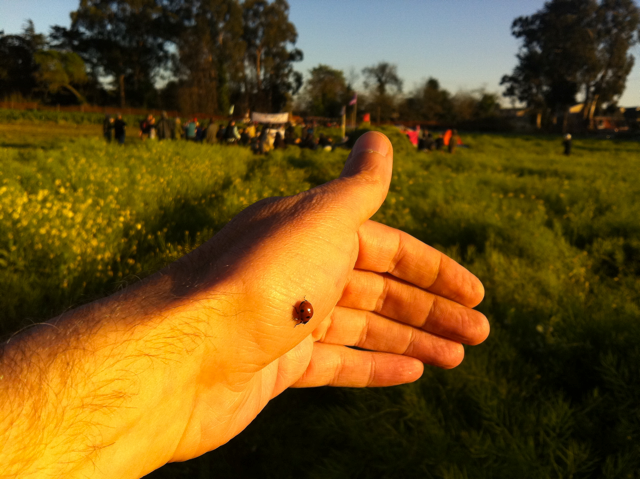 We have large institutions for pickling great paintings and sculptures, but outdoor work designed to heal the earth and support our communities is a different animal. While a project can have representative images and installations at these museums (usually as part of a temporary exhibition), the real work gets done on the ground and in context. Like in an ecosystem, we need the dew drops and temporary projects to delight and attract. We also require specific medium term artful initiatives to control erosion, channel rainwater, educate people longer term and connect current and future generations to the land. It falls to the long term, multi-generational projects, however, to provide a long term vision that considers the implications and resilience needed to cope with, say, a 2-6 degree rise in global temperatures over the next few hundred years. It seems we’d want to look at rising water levels – how would this affect the Schuylkill River? What local conditions will we need to ensure maximum biodiversity and habitat support for migrating species seeking more favorable habitats? In nature, we can see the extraordinary interplay of finely tuned life cycles working together to support the system as a whole. As these delicately synchronized dances grow increasingly out of synch with pollution, temperature and weather changes, what we know and have studied over the past hundreds of years will require new interpretation. It will become less about restoration of past conditions and more about our capacity to surf these changes. Our notion of what art is will also need to change. For ecological art to be effective, we will need to think along multiple time scales and beyond the individual artwork, towards a future-oriented cultural system as a whole. How can the brief delightful moments support the larger arc of history? Can we begin to layer and combine artworks to support each other, much like the shift from unicellular to multi-cellular life? I’m looking forward to the role the Schuylkill Center can play in this civilizational shift. It is a precious opportunity to contribute to our times and help develop new cultural patterns for generations to come.